Happiness can’t be bought with money. This is one of those adages that has stood the test of time. In a world where people are suffering from different kinds of sadness so much that calling oneself depressed is now a ‘cool’ thing, happiness IS a rare commodity. But like the Middle-East sits on oil, and America on junk food, Finland sits on happiness. The Nordic country has been named the happiest country in the world by the 2019 World Happiness Report among 156 countries. It has won this title for the second year in a row, and they also rank among the top 5 safest countries to live in. If you weren’t already planning a trip to the country, here is a piece of information which may compel you to live there permanently: They have been formerly ranked by the Legatum Institute’s Property Index as the country with the highest quality of life. But how does this country maintain this happiness? For starters, it is extremely charming, calming, picturesque and invigorating. It has over 187 thousand natural lakes. The serene waters can calm even the most restless of people. They indulge in sports like mosquito hunting, wife carrying championships and air guitar. Now you must really be wanting to go there. Like most happy people, the Finnish cherish an easy and simple lifestyle. Their education system is one of the best in the world. This is validated by their consistent presence in the top ranks of the Program for International Student Assessment. We get it. If the Earth was a classroom Finland would be the bright first bencher who comes first, has adequately strict parents and stays away from unnecessary spotlight. However, it is also the kid who is willing to help others, as demonstrated by its newest initiative. They will be offering free tours to lucky winners of a contest who get local guides, dubbed “happiness guides” to teach people how to be happy. 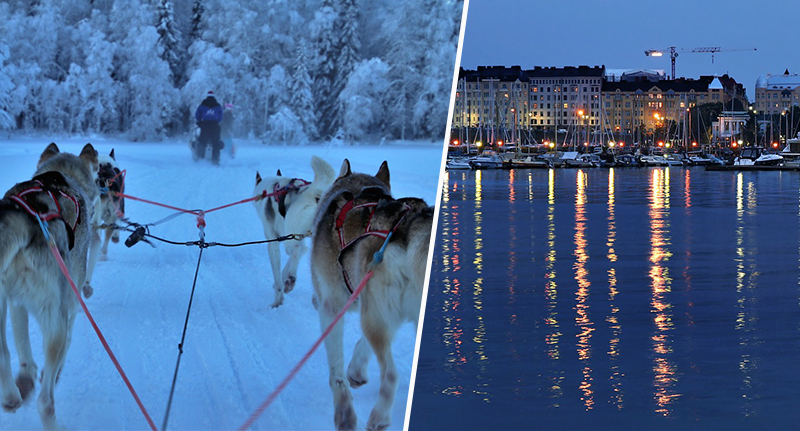 This initiative, dubbed the ‘Rent a Finn’ program, is a bid by Visit Finland, the official travel website of the country. eight locals have been selected for being the “happiness guides”, and each tourist will be staying with one of them. The citizens are ardent lovers of nature, and it’s a known fact that when they get sad they go to the woods or a natural retreat and come back calmer and re-energized. To apply, one has to create a 3-minute video, describing their important aspects, their relationship with nature and what they hope to do when they tour Finland. One will also have to fill out an application form and then wait, wait to be selected on one of the best tours they will ever experience in their lives.